Samuel Adams wants to help Red Sox fans celebrate with a beer honoring the 2018 World Series championsl. 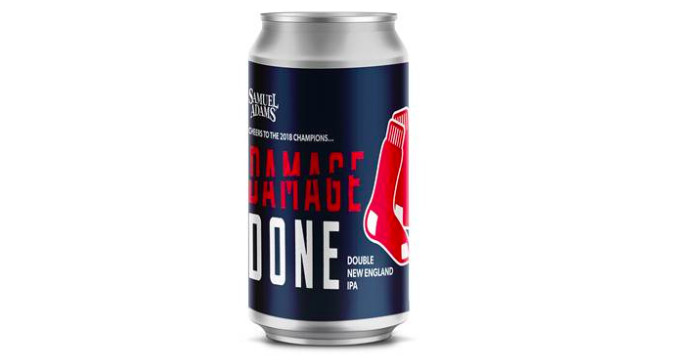 Samuel Adams will be releasing the "Damage Done" double IPA on Tuesday night at 5 p.m. ET and it will be available through the end of the week, according to a statement from company communication specialist Meaghan Quinn. The 7.3 percent double IPA is "aged on vanilla beans with guava, mango and lactose added for as much fun and flavor as the Sox themselves" wrote Quinn. The IPA will only be available at the Samuel Adams Boston Brewery. Visitors to the brewery can purchase a 32 oz. crowler of the beer or grab a glass on draft, as well as pick up a commemorative Red Sox koozie and posters for the Red Sox World Series parade that will be Wednesday. This is the first year Samuel Adams is the official beer of the Boston Red Sox.